You can find big, bulky, heavy rings from many sources, but what if you need svelt, light-weight rings for a weight-restricted benchrest rifle, or need light-weight offset rings or benchrest-grade .22 RF rings? Well now there’s a source for these specialized rings — Morr Accuracy. Beautifully crafted by John Morrison, these ring-sets offer many nice features you won’t find elsewhere. Chose from various heights and 2-fastener or 4-fastener models. You can even get a combo set (one 4-screw and one 2-screw). Got a dove-tailed rimfire action? 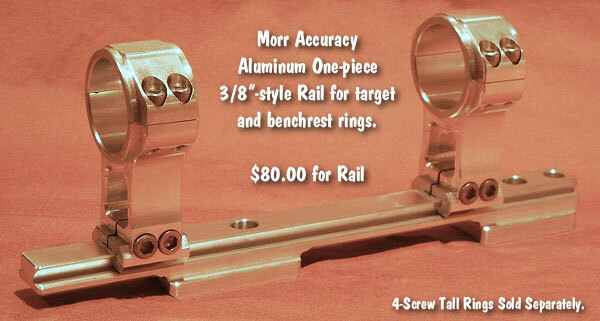 Check this out — Morr Accuracy has rimfire rings designed for factory 11mm dovetails. But these will also fit aftermarket 3/8″ rails, so if you later decide to mount a rail, you won’t need a new set of rings. That’s clever. For more information, email john [at] morraccuracy.com or call (201) 537-5374. VOICE FILE: Click Button to hear John Morrison TALK about his Rings and Bases. These offset rings allow shooters to get slightly away from the stock so as not to disturb the rifle in the rest during shooting. These are a beautiful design, unique in their simplicity. They are offered in a silver-tone finish as well as the Gold Anodized finish shown below. Morrison says: “There are other offset rings using multiple components, but we decided to integrate the offset into the rings themselves and eliminate some complexity. We also took advantage of finite element analysis to eliminate extra weight in the new Edge offset rings without sacrificing strength.” Weighing just 1.5 oz. 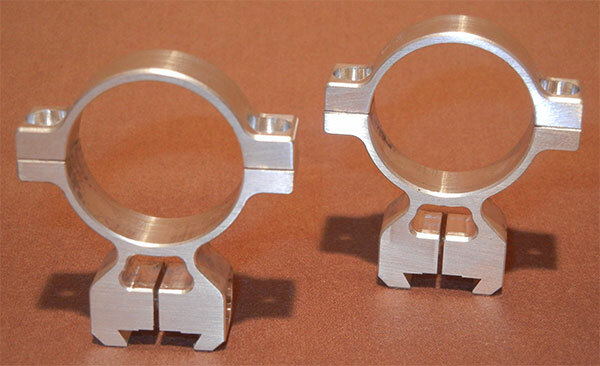 per pair, these offset rings are offered for 1″ or 30mm scope tubes and for 11mm or 3/8″ rails. 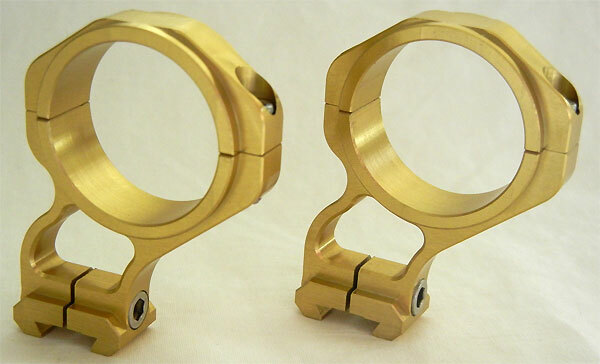 Price is $75.00 per set ($78.00 with Gold Anodizing). World’s Lightest Rings — Magnesium Air Weight Rings — Just 0.6 Ounces Per Set! The Air Weight rings were designed specifically for the .22 Sporter Class shooter where every ounce counts. These Morr Accuracy Air Weights may well be the lightest commercially available rings you can buy. They weigh just over 0.6 oz. for a pair of two rings, including all the fasteners. John Morrison says: “We couldn’t quite make our goal of lightest ever with any of the aluminum alloys, so we went to magnesium, which is the lightest, commonly available alloy. Magnesium presents some specific machining challenges, but we felt that the added care needed was worth it for the result.” The .22 Air Weight Rings are available for both 1″ and 30mm scope tubes at $98.00 per pair. John Morrison served in the U.S. Marines Corps as a marksmanship instructor, so he understands the requirements of tactical shooting. Along with these lightweight rings and rails designed for target shooters, Morr Accuracy also offers sturdy Tactical Rings and Rails. Priced at $125.00 per set, Morr Accuracy’s Tactical Rings are made from 7075 aluminum alloy, with 17-4 stainless steel cross bolts, nuts and clamps. These are offered for 30mm tubes in 1″, 1.25″, and 1.5″ heights. This is very nice ring set for the price. Share the post "Outstanding Rings and Rails from Morr Accuracy"
We know many readers have been searching high and low for components and high-quality ammunition, particularly for popular chamberings such as the .308 Winchester. Well Santa delivered something nice for you .308 shooters. 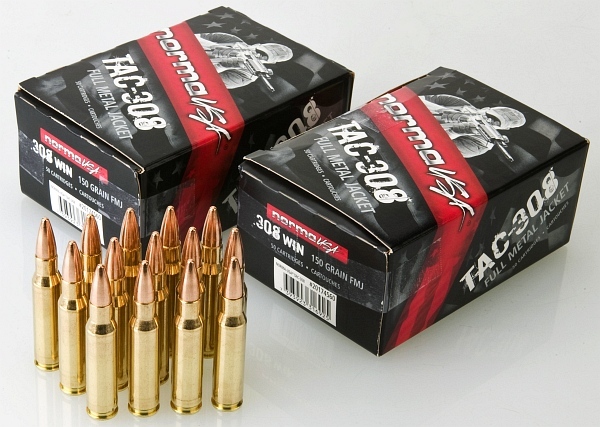 Bullets.com received a large shipment of Norma-brand Tac .308 ammo. This is good stuff — Norma brass loaded with a quality 150gr Norma FMJ bullet. This Tac-308 ammo is now in stock and On Sale for $53.50 for fifty (50) rounds at Bullets.com. If you can find this elsewhere, you’ll pay $65.00 or more per box. And remember, you’ve got quality Norma brass that will last for many reloadings after the ammo is fired. When you consider the value of the brass for reloading, this deal is even more attractive. Share the post "Norma .308 Winchester Ammo On Sale at Bullets.com"
For many cartridge types, Hornady Superformance ammunition provides enhanced velocity compared to some other types of factory-loaded ammo. However, Hornady has found that there may be issues when Superformance ammo is shot in gas-operated guns with barrels under 20″, or with barrels fitted with suppressors. This is because the gas returning from the barrel port may cause the bolt to begin unlocking prematurely. 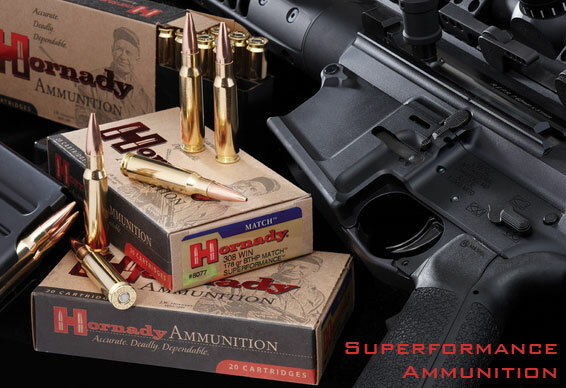 Hornady has published the following information concerning the uses of Superformance ammo in direct impingment and gas piston self-loading rifles. Superformance™ ammunition is tested and is safely within SAAMI pressure guidelines. Gas operated (direct impingement or gas piston) firearms are perfectly safe to use with Superformance ammunition. However, Hornady ballisticians have conducted testing with a variety of guns (including guns equipped with suppressors), and our findings conclude that some systems work far better with Superformance ammunition than others. It is recommended that to get the best functioning with Superformance ammunition in gas operated/gas piston semi-automatic or select fire guns, rifle length gas systems with 20 inch or longer barrel lengths are best for reliable firing and extraction. Any other configuration — particularly shorter barrels/gas systems — are best served with the installation of an adjustable gas system, ESPECIALLY if a suppressor is to be installed. Due to the longer duration of peak pressure produced by Superformance, the post peak/declining port pressure at common carbine and mid-length gas port locations is still higher than that produced by standard propellant. This has a tendency to flood the system with a larger volume of gas, at a higher velocity, that tries to open the bolt of the gun too fast. It’s a timing issue. The cartridge case is still swollen from the application of pressure during firing while the gun is simultaneously trying to extract the cartridge case before it has had an opportunity to settle back to its original size, or more simply: the gun is still in the process or firing while it’s trying to extract the cartridge case. If the firearm and the ammunition are not in sync, there can be what is commonly identified as “pressure signs” on the cartridge case. This is exhibited by the movement/marring of the head of the cartridge case, cratered primers, flat primers, ripped or ruptured cartridge cases, “popped primers”, and/or any combination of these effects. If any of these “pressure signs”; are apparent, stop firing immediately. If an adjustable gas system is installed, it is advisable to reduce the amount of gas flowing through the system by closing the gas port until the gun operates correctly. With the installation of an adjustable gas system, gas pressure can be metered to a point that enough gas is applied to open the bolt, but at a slower rate to allow the cartridge case to return to its original diameter prior to the movement of the bolt, and thus allow for proper extraction. Due to the longer duration of peak pressure produced by Superformance™, the post peak/declining pressure at common carbine and mid-length gas port locations is still higher than that produced by standard propellant. However, there is very little difference in port pressure between Superformance™ and standard propellants at the rifle length port location. The use of suppressors on rifles creates yet another dynamic in firearms design that is not commonly understood or communicated. Consider the suppressor on a firearm the same as a muffler on a car. The suppressor works as a filter for the gas (noise) that is escaping the barrel during firing. As a “filter”, it takes longer for the gas to leave the confines of the firearm, and thus, it creates back pressure. This back pressure, ESPECIALLY in a gas operated firearm forces an extensive amount of gas back through the firearm’s operating system that may create too much thrust too early during the firearm’s cycle of operation. To counteract this back pressure, the use of an adjustable gas system is advised. By metering the gas system to ensure that it will cycle the firearm correctly and not flood the system with gas/pressure, the gun will work properly and will still benefit dramatically from the increased velocity potential of Superformance ammunition. Share the post "Superformance Ammo in Gas Guns — Hornady TECH Advice"